We contact our customers for feedback quarterly. It gives them a chance to let us know if if there is anything we could do better or whether there is anything they want us to focus on. We ask them to score us as either Excellent, Good, Average or Poor. 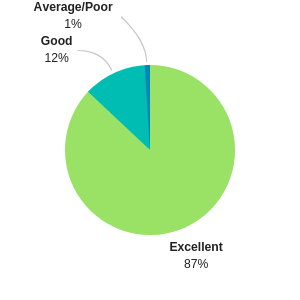 We aim to get at least 85% Excellent and our staff work hard to ensure that this happens. You can find some more detailed customer feedback below. G5 Technologies and in particular, Richard, have provided us with excellent support and service for the last 10 years. All IT issues are resolved quickly and efficiently. Thanks to everyone at G5 for making our life easier! At McCue and Porter our business relies heavily on a good and reliable computer installation. That’s why, 5 years ago we asked G5 to install a new computer network system in our organisation. The System supports up to 15 workstations and during its installation we suffered no downtime to our business. In the intervening 5 year period, we have had a good and reliable backup system from G5 which has kept our system up to date and fully backed up and all hardware systems operational. That’s why I have no hesitation recommending G5 for all your computer system and networking needs. At Fyfe Moir & Associates we have a pragmatic approach to IT, in that we expect from time to time it will fail. That was why it was so important 4 years ago; that we chose an IT partner who we knew could work very closely with us. And in G5 that is what we found, an IT partner that goes about their business with a minimum of fuss and can get us up and working again with a minimum of downtime, which is very important to us not only in terms of our own profitability but also in dealing with our clients demands. If anyone is looking for an it partner who will provide this kind of service, we can heartily recommend G5 technologies. Steve and his team at G5 have been providing IT services and public Wi-Fi to the hotel since 2005. The scope of services has included everything from the simple supply of new laptops to the full replacement of our Property Management System and server including re-installation of all software. The guest Wi-Fi system has worked seamlessly since 2005 and in 2013 a full upgrade of this system took place to coincide with our decision to start offering the service free of charge to our customers. G5 replaced all the older equipment with new high-end Meraki access points together with a super-fast fibre-optic internet connection. This has directly resulted in a 24% increase in guest satisfaction for connectivity and internet services. The Meraki system also has the added benefit of complete cloud access allowing remote support and full data reporting. Over the past 14 years, G5 have been an invaluable IT partner for us and the service has been unquestionably professional and friendly. The fact that they operate locally and can be on-site within minutes for any urgent problems is also a huge added bonus. As a family run, service orientated business it was important to us that any supplier to our students (tenants) were working to the same level that we hold ourselves. G5 have shown the utmost professionalism from initial contact to ongoing service provision. There is a level of care and attention that is so often lacking in larger organisations. The installation service was straightforward and in retrofit applications showed consideration for causing minimal damage and disruption to the existing building fabric. The ongoing service provided is attentive and responsive ensuring that the end users have reliable and consistent service. I have thoroughly enjoyed working with the team at G5 and they will continue to be our partner for internet/Wi-Fi across all our properties. I would highly recommend working with them, and look forward to doing so with further new projects in the future. We decided during 2012 that all our hotels should have the broadband Wi-Fi services renewed and replaced; and for this, in Aberdeen we chose G5 Technologies. It is refreshing to find a company which “does what it says on the tin” ie survey, quote, installation, all done professionally, and within a reasonable timescale. Since installation, we have had seamless, fast, uninterrupted service and any feedback from guests is all positive; all our bedrooms and public areas have Wi-Fi. It is such a relief to have that area of our service provision to guests fully covered. We will use their services again as and when required, and recommend them to any of our hotel colleagues out there looking for hotel Wi-Fi services. When IT is not your thing you need to rely heavily on your IT partner which is what I’ve done over the last 14 years with G5. The G5 team have gone above and beyond to hold my hand through a very stressful time recently following a hack of my Microsoft 365 email, thanks guys for looking after me. I would like to take the opportunity to express how pleased I am with our new office Wi-Fi. Documents that would have previously taken a while to upload are now uploaded instantly, I notice a big difference in day to day speed of the internet too. I have no doubt this will save us a lot of valuable time over the year. I would have no hesitation in recommending your service to other businesses. Having worked with a couple of other IT Companies over the years, it’s been a breath of fresh air to now work with G5. With a very professional and client centred proposition we are looked after very well and not sold to if things aren’t needed. Response times are excellent. Steve & the team at G5 definitely come highly recommended.